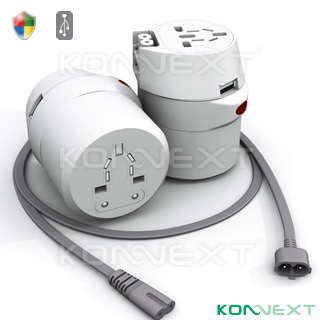 The new AdapterOne™ Portable Power Strip with USB Charger & Surge Protection keep you connected in over 150 countries. The unique one piece design offers extraordIHAry travel convenience and the new “Twist & Release” mechanism allows user to select 4 different socket styles effortlessly. The AdapterOne™ equips with built-in universal USB charger, universal AC outlet, the new SmartPlug™ Direct AC Slot and the Surge Protection circuit will also provide protection to any harmful surge and spikes from your electronics. Combining all these features, the new AdapterOne™ Portable Power Strip with USB Charger & Surge Protection is probably the most features packed and safest travel power solution in the world.